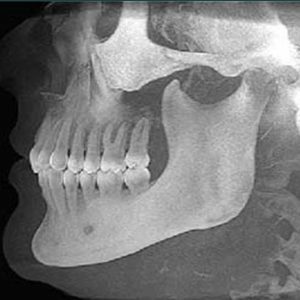 In October of 2009, a patient being treated for rheumatoid arthritis was referred for a TMJ exam. She had a pain of “7” (on a scale of 1 – 10, 10 being the most painful) in the left condyle. She had trouble biting and felt that her bite was “off.” What follows is a detailed synopsis of the treatment of a patient in which a recovery from arthritis in the jaw joint was identified and documented. December 4, 2009: a Cone Beam CT Scan was done. On January 6, 2010, an occlusal correction was done and impressions for a night guard were taken. A Whip Mix 8500 semi-adjustable articulator was used. January 23, 2010: the night guard was delivered. Feb. 6, 2010 NG (Night Guard) adjusted. March 27, 2010: the follow up exam showed no occlusal changes, the night guard was comfortable and chewing was OK.
Sept. 11, 2010: NG (Night Guard) adjusted. October 30, 2014: No other treatment until a Zirconia crown was done on #30. A new Cone Beam CT was recommended, but not done. October 15, 2015: an occlusal adjustment was done and the NG was adjusted. January 23, 2016: an e-Max was done on #13. March 11, 2016: new Cone Beam CT Scans done and 2009 and 2016 Scans were sent to Beam Readers for comparison. That report stated that there were some areas of improvement in the condyles. This was a remarkable result obtained by precise occlusal management by her dentist and state of the art medications by her Rheumatologist. The teamwork bore great fruit. *The information in this site is provided for informational use only (it is not advice) and should never be considered a substitute for consulting your doctor.